Meet the Cast of "Star Wars: The Force Awakens." Image 4 of 6 Star Wars cast member John Boyega poses for Swiss photographer Marco Grob (@marcogrob) for @TIME's latest cover story. After people on the internet expressed anger about a black storm trooper in the trailer for the upcoming sequel, J.J. Abrams spoke to on an appearance on the Howard Stern Show: "I think the people are complaining about that probably have bigger problems than there's a black storm trooper," Abrams told stern. He said Boyega did an "extraordinary" job in the movie. Read the full story on LightBox.time.com. Photo taken at Fox Studios LA on Oct. 26, 2015. Meet the Cast of "Star Wars: The Force Awakens." Image 3 of 6 Star Wars cast member Gwendoline Christie poses for Swiss photographer Marco Grob (@marcogrob) for @TIME's latest cover story. Christie has made a career of playing strong women: Brienne of Tarth on Game of Thrones, Comander Lume in The Hunger Games series and now, Captain Phasma in the upcoming Star Wars sequel. Her costume has particular significance, she tells TIME. "It is rare that women get to play a character and below the neck they are really covered up to the extent that you cannot really see the flesh outlines of their body," she says. "It felt really progressive to me. And consequently I'm very proud to play this part because yeah, you look at her and she looks badass. But also it means something much deeper and it represents something of proper progressive thought." Go behind the scenes of TIME's #StarWars photo shoot at LightBox.time.com. Photo taken at Pinewood Studios London on Oct. 29, 2015. Meet the Cast of "Star Wars: The Force Awakens." Image 2 of 6 Swiss photographer Marco Grob (@marcogrob) captures 23-year-old British actress Daisy Ridley for @TIME's latest cover story. Ridley will star in her first film as the character Rey, a female scavenger who was abandoned by her family when she was five years old, in the upcoming Star Wars sequel. 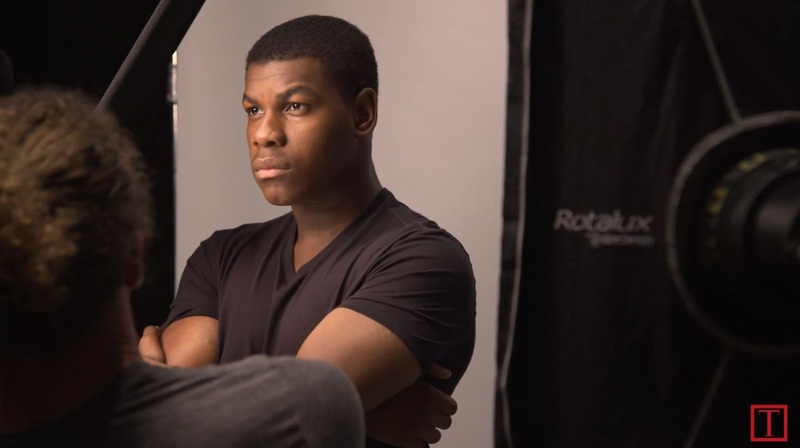 Go behind the scenes of TIME's #StarWars photo shoot at LightBox.time.com. Photo taken at Pinewood Studios London on Oct. 29, 2015. Meet the Cast of "Star Wars: The Force Awakens." Image 1 of 6 Swiss photographer Marco Grob (@marcogrob) captures Star Wars cast members, including Oscar Isaac who takes on the role of X-wing pilot Poe Dameron, for @TIME's latest cover story. His character, a leader in the fight against the First Order in the new sequel, is befitting, he says, as he recalls reenacting fight scenes as a child with his uncle and cousins. "We would throw Star Wars-themed parties and collect the toys and dress up as the characters and actually memorize the fight scenes, the duels," he says. "We’d try to reenact them with the lightsabers, but to a T. You know, say, “'okay no no no he goes left, right, left, right and then down.'" Go behind the scenes of TIME's #StarWars photo shoot at LightBox.time.com. Photo taken in Madrid, Spain on Oct. 31, 2015.